The easiest way to get your business to the top of Google is by ranking in Google maps a.k.a the local 3-pack. 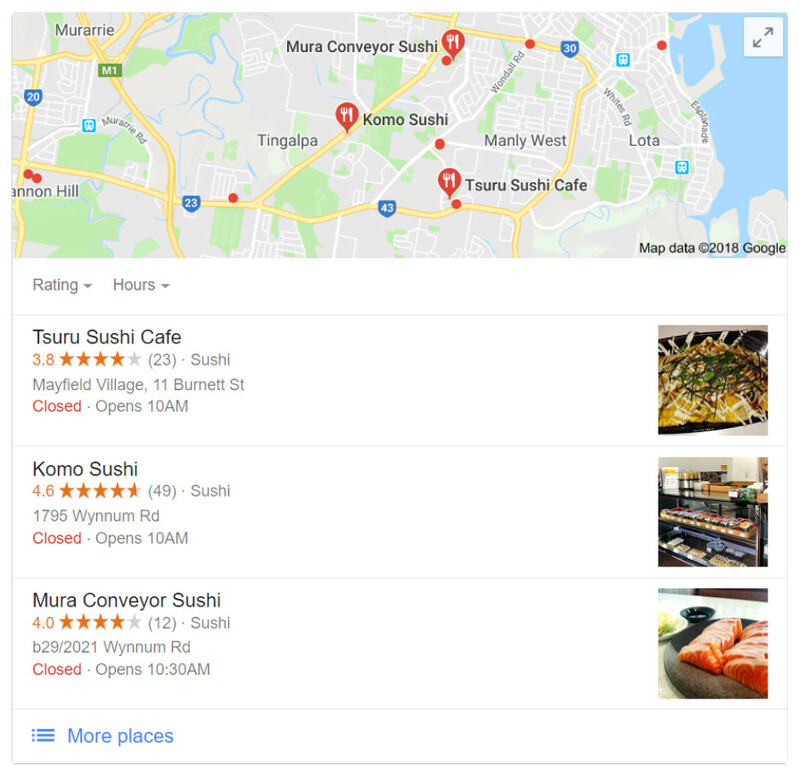 The local 3-pack refers to the map and 3 local business listings that appears for local queries on Google (see image above). The local pack is positioned below the paid ads and above the organic results on the search engine results page. Google has also recently started including one paid ad at the top of the local pack. How Can Ranking In The Local Pack Can Benefit Your Business? The local pack gives local businesses a chance to rank on the first page of Google in a time when online businesses are growing in popularity and authority. This means that simply having a physical store located in the area that a local query was performed gives you an advantage over market dominating online competitors such as Amazon, Gumtree, and many others. Additionally, the local pack allows users to contact or visit your store without even having to visit your website via the click-to-call and click for directions buttons on the search results page. A study conducted by Moz found that the local search pack received between 33% and 44% of the total clicks on page one of Google when displayed above all organic results. Additionally, listings with reviews in the local pack received a much greater portion of the total clicks than those without any reviews. One of the most important steps to increase the chances of your business ranking in the local pack is to create or claim your Google My Business (GMB) listing and verify your location. (Click here for a step-by-step guide on how to set up a Google My Business listing). During the setup process of your GMB listing you will be instructed to enter your address in order to receive a verification postcard from Google. Once you have received the postcard you can use it to verify your business’s location. This is an essential step to start ranking in the local pack as you can only manage and update your business information in the listing once the location has been verified. To improve your local rankings on Google it is important to complete as much information as possible on your GMB listing as Google has said “businesses with complete and accurate information are easier to match with the right searches”. You can also create posts on your Google My Business listing to promote new products, sales or events, and answer questions about your business in the questions & answers section. Another key step in optimising your GMB listing to rank in the local pack is to add images. Images can be added to your listing to display your products and services to your customers as well as showing what your physical store looks like in order to make it easier to locate. Additionally, the profile picture on your GMB listing will appear whenever you create a post or respond to a review, so it is important to use an image that accurately represents your business. One great feature of a Google My Business listing is that it allows you to update your business hours for holidays and events. It is important to keep your business hours as up-to-date as possible on GMB. This is because when a listing is displayed in the local pack Google will also display whether or not the business is open, and if so, when it will be closing. As the business address and directions are also accessible from the local pack listing, customers may visit your store without ever having visited your website. This means that if your opening hours haven’t been updated you could be sending customers to a closed store which will harm the reputation of your brand and potentially lose you precious customers. Conversely, if your opening hours have been extended for the holiday period, but not updated, potential customers may see that your business is closed causing them to shop with a competitor instead. Creating a Google My Business listing also gives your customers a platform to review your business. Obtaining positive reviews on your GMB listings is an important step in ranking your business in the local pack. And, as mentioned earlier, reviews in a local pack listing can also increase the number of clicks your listings will get. (Click here for more information on how to obtain new reviews). In addition to obtaining new reviews, it is also important to respond to any reviews your business receives, both positive and negative. This shows potential customers who may read your reviews that you take customer feedback seriously. Additionally, responding to negative reviews provides an opportunity to turn unsatisfied customers into brand ambassadors by listening to their concerns and providing a solution. Another way to optimise your business to rank in Google’s local pack is by obtaining local citations. The easiest way to obtain new local citations is through local business directories. All you need to do is create a listing for your business and fill out as much information as possible. However, it is essential to ensure that your business NAP (name, address and phone number) is consistent throughout all citations, including your Google My Business listings. This includes using abbreviations such as “st” instead or “street” in your address, choose one version and stick to it. Obtaining multiple local citations for your business with consistent NAP will benefit your rankings in two ways. Firstly, each citation for your business that Google finds that has the same NAP as your GMB listing will incite more trust that the information on your listing is accurate. Secondly, when you obtain local citations it strengthens your website’s association with the service area you are targeting. This will increase your chances of rankings in the local pack for search queries related to your target service area. Once you have successfully created and optimised a GMB listing for your business and obtained local citations with consistent NAP, your chances of ranking in the local search pack for search queries relevant to your area will skyrocket. Taking the bold lunge into business but not 100% sure where to start online? The truth is most business owners aren’t really sure where to start when it comes to bringing in customers that aren’t word of mouth. Thats where we come in. We’re passionate about helping local Brisbane businesses thrive, and we know what you need to do to get your business moving.